﻿ Parts Washer with Stand and Wheels,Parts Washer,Parts Cleaner,Automatic Parts Washer Manufacturer,Supplier,Factory - Cnjacks Enterprise Co., Ltd.
Keep your equipments, parts and shop tidy and clean with a parts washer. Cnjacks offer quality parts washers with varied volumes. These durable parts washing stations include a built-in drain, small parts basket, work shelf, storage shelf and chrome faucet. 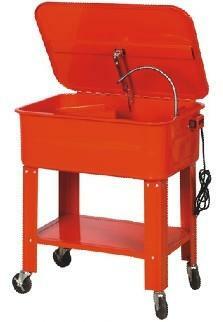 Some parts washer models offer wheels so you can conveniently move the washing station around your shop. No automotive or machine shop should be without a parts washer. electric requirement: 110V/60Hz (240V/50Hz) solvent pump. Max pump output through spigot: Recirculates 2.7~3.3 litre / min of solvent.